The Abaco One Stop A-Frame Pro comes with four safety arms for additional security while transporting and storing material within the shop or at the job site. Your slabs are placed on special rubber profiles and secured with four ratchet securing bars. The center section can be used to store tools, backsplashes, ect. The frame features two eyelets that can be used to hoist the A-Frame with an overhead crane. 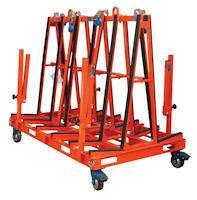 Space is provided on all sides of the base for lifting with a forklift truck. Quick release mounting pins change the unit from a movable one to a stationary one with the removal of the four provided casters.